Well, I announced last week that we have decided to move to South Dakota and I thought it would be a great time to show off our new (Uh-hum!) place. My husband has always dreamed of owning some land, so we looked for acreages in the area and found the most beautiful lot. It was a rolling 5.1 acres, covered in trees, wildlife, and a nice sized stocked fishing pond. Sounds great, right? Well, the only problem is the house. The house on the lot was built in the 1970s and still looks like it’s in the 1970s. For the last three months we have been thinking of buying this property and finally were able to negotiate the price down to basically the value of the land. Now as you can tell from my wording, we are not a fan of the house. In addition to the bad roof and bad decks, the whole house has a really choppy layout and each room is very closed in. There is only one bathroom for the three bedrooms on the main floor and it is very outdated and small. On top of all that, I am scared of the basement. It’s dark and gross down there! It has low ceilings and smells like mildew (not to mention the spiders and dead mice!!) We have brought in a few contractors to find out the cost of a major remodel, but due to the low ceilings in the basement and the strange utility layout, we found out that to cost to remodel the home would basically be more than to build a new one and take a longer time. So our plan is to live in this house for a few years, until we can pay it off, and then build our own custom home. I know I make the house sound horrible, but it’s really not that bad, it’s just not what we want to live in for the rest of our lives. A very strange entryway don’t you think? This awesome 70s fo-stone wall, wood paneling, and shiny brass lighting. The master bedroom. It’s very small but has a deck looking over the pond, which is nice. Ok, whoever thought of a brown bathtub?? At least we have one I guess. It’s the only working shower in the house! The stairs to the scary basement…I am not going to show you that because I plan on never going down there unless there is a tornado. And the whole reason we bought this place, the yard. This is a view from the street (aka dirt road). I pieced this together from a few photos. Shoveling snow should be fun this winter with this long drive. The boat dock and west side of the water. See the rings in the water? There are frogs and fish everywhere! Anyways, that’s the new place (click here if you would like to see all the photos). I could have put up about a million photos of the yard, but you get the idea. There is a lot of work to be done on the place. My mission this last week and next week will be cleaning up the place, spraying for insects, and baiting mice. Luckily, I haven’t found anymore mice in the house other than a dead one, so I am just thinking he might have been a lone ranger in the house and expected because the house is in the country and was empty for two years. I plan to paint a little to make the house feel more homey. Even though I am not impressed by the place, it’s not really that terrible of place to live. We plan to really work on the yard for the next few years. We would like to add a fire pit, garden, stairs down to the pond, and kill all the millions of dandelions in the yard. Let’s just say, even though we won’t be doing much to the inside, we still have a ton of work to do on the outside! The time is finally here! We have finished the last bathroom! We have remodeled all five of our bathrooms (see previous bathrooms 1, 2, 3, & 4.) Well, not all the way remodeled…we removed the wallpaper in all of them, repainted the walls, resurfaced the wood, and in some of them installed ceramic tile. This final bathroom was in the basement and the walls were outdated with late 80s style wallpaper. We removed all the wallpaper and painted it a nice blue color. It’s really nice to finally be done with all of the five bathrooms in our house. Well, not done completely as we would like. Ideally, we would have loved to install ceramic tile in all of the bathrooms, but due to unforeseen circumstances, we had to do the bare minimal to make them look great. Usually it was just a matter of removing the wallpaper. What are these unforeseen circumstances???? Well, I will announce them next week….stay tuned! We have been very busy on the removing the wallpapaper from the last two bathrooms in our house. We have already redone three of our five bathrooms(see posts 1, 2, & 3) and we are so happy to now be finished with all five! I thought I would reveal the results in two posts. This post is master bathroom. We removed the wallpaper and resurfaced the wood. You will notice that we still have carpet in our master bedroom, which we would love to remove but we decided not to do that at this point and time. Lots of lovely blue wallpaper. There is a shower area, opposite of the closet doors, but I didn’t take pictures of it. And here is the picture of after! Stay tuned for the post on the final bathroom! I have been long overdue to talk about the results of our guest bedroom remodel, a blog I wrote months ago. Well, the room has been finished for a while and I thought I should show you the results. This room is the guest room right next to the master bedroom. We really didn’t end up doing much to the room. Just removing the wallpapers and cleaning up the woodwork. The room has this ugly maroon carpet, but we are going to wait to replace it till a later point and time. I would LOVE to replace it now, but it’s just an extra expense we are trying not to have. It had ugly pink striped wallpaper. We decided to paint the walls a color that didn’t clash with the maroon carpet and that was pretty neutral. In an effort to save money on this somewhat remodel, I decided to mix all of our partial cans of paint together. I had no idea of the color we would get, but the partial cans of paint are mainly beige and white, so I knew it would be something close to the color I would want. The color turned out to be a very light beige, which was perfect! We swapped out the light fixture and called the room good…granted it still has that SUPER ugly maroon carpet, but we will deal with that later. Here is the room after: It doesn’t look that different from the first picture, but I am always glad to see one less room with wallpaper! Here we are, starting another room in the house…again! This room is the guest room right next to the master bedroom. Unlike many of the other remodels, I don’t think you will see much of a difference with this room. We plan on just painting the walls, resurfacing the woodwork, and replacing the light fixture. The room has this ugly maroon carpet, but we are going to wait to replace it till a later point and time. I would LOVE to replace it now, but it’s just an extra expense we are trying not to have. Here is the ugly pink striped wallpaper. It’s a perfect compliment to the maroon carpet don’t you think? The big question…what color to paint the walls so that the maroon carpet doesn’t clash? My choices are limited to pretty much white, cream, or beige. I have decided to let fate decide. We have so many partial cans of paint, mainly beige and white. My plan is to mix them all together and see what color comes out. I have been trying to remodel this house with the least amount of money spent…we will see how the color turns out! Wish me luck! I am little behind in my blogging, to say the least…I wrote a post back at the beginning of January about us remodeling our living room. Well, the remodel has been finished for weeks now! 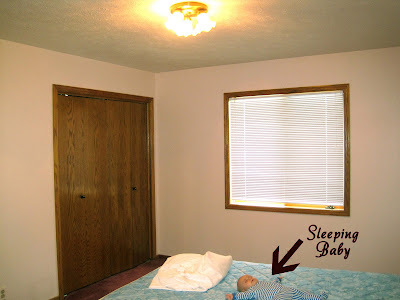 In fact, we were able to remodel the room in about 5 days, with the help of my husband’s family. So I want to shout out a big “THANK YOU” to his family for helping us out! Removing wallpaper goes much faster with five people peeling it off the walls. We were lucky enough to find out that the wallpaper was actually primed behind! It was our first room in the house that didn’t have wallpaper directly on the drywall! With the help of some hot water in a spray bottle and a steamer we were able to remove all of the wallpaper with little patching. After the wallpaper was gone, we painted three of the walls a beige color that matched our formal dining room. I wanted a little color in the room, so on the south wall we painted it red, Valspar’s Royal Garnet to be exact. It looked so pretty with my pictures I had on the wall. In addition to the painting, we resurfaced all of the wood in the room (which was a ton!) and changed out the light fixture to something not so dated. Also, I got a little crafty and decided to make some shams for above the shades and cover my lampshades in a red material that matched the garnet wall. Here is a view of the room looking at the built in bar. Notice the new light fixture. We decided to go with something pretty plain because we really want the focal point of the room to be the large windows and red wall. The before view of the floor to ceiling windows that look over the lake. Well that’s it for the new living room! The red wall is by far my favorite part of the room. I think it gives the room a nice vibrant look and the red is great contrast to the green pines in the backyard. My husband and I keep asking ourselves why we waited so long to redo this room. It is such a nice feeling now to be surrounded with the beautiful view outside through the windows and beautiful walls inside. 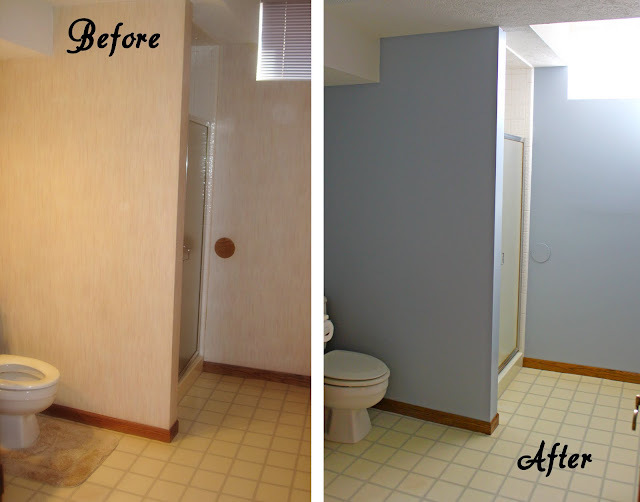 It is truly amazing what a little paint can do to a room! It is finally finished…the remodeling of the third bathroom. 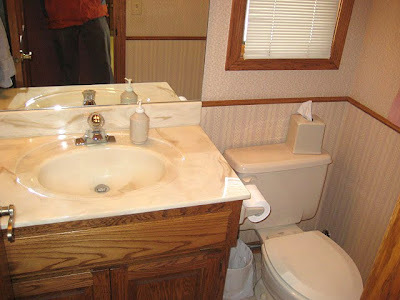 I started writing about this bathroom remodel over a month ago, but due to my laziness (and a personal situation that I will go into a few months from now) I have not been able to show you the finished results. The bathroom has been done now for about three weeks and we are in love with the results! 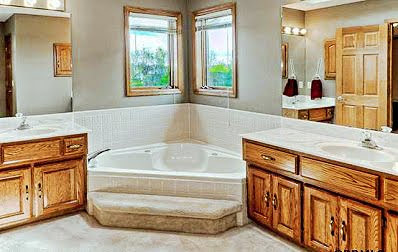 This bathroom is on the main floor of the house and it is just a half bath, which made the remodel go much faster. The room was much like the others in this house– dated wallpaper and light fixture. However, this bathroom we had one additional problem that the other two didn’t have, a leaky toilet. Not too long after we bought the house I was cleaning the floor and discovered that the floor was sinking in behind the toilet. The toilet must have been leaking for years. It turns out the leak was in the tank. The good, handyman hubby that I have took the toilet apart and replaced the rubber ring between the tank and bowl, which fixed the leak. The floor was really damaged, so the hubby had to tear out the floor down to the joists of the house and replace it. It was quite the process and I can say that I watched in awe as he did his manly handyman project. After the floor was tiled, we painted the walls, hung a curtain, replace the light fixture, refinished the wood, reinstalled the trim and chair rail, changed out the handles on the cupboard, and reinstalled the toilet. I am happy to say we have another room down, which means that we have four major rooms to go: living room, upstairs guest room, master bathroom, and the basement bathroom. After we get those rooms all finished, who knows what we will do with our free time. We have been talking about building a wine cellar, but I guess we will see when the time comes! We are off again on another room to remodel, this time it’s the living room! There will only be three major rooms after we finish this one. With my husband off this month, this remodel might go fast! We just finished remodeling our bathroom, but I will post those pictures later on in the week. I wanted to first give you a sneak peak at the living room before we start transforming it. There is a ton of woodwork in this room. I love the color red with all of the woodwork, so I am thinking about having one red wall and the rest of the walls to be a light brown color. I would like to transform these lampshades to match the one red wall. I love the floor to ceiling windows that look over the lake. Here is the ugly wallpaper in this room, it is very similar to the wallpaper we had in the nursery. And the ugly light fixture…I have no idea what to replace this with. If you have any ideas for a new light there, please let me know. Well, that is the next room that we are working on. I am hoping to get it finished soon! It is exciting to say that the Laundry Room has been redone! It was probably one of the fastest remodeling projects we have done to date! The room is right off the garage, so we usually dump a ton of things in it when we get home. I removed the wallpaper and painted the walls. I have been on this quest to remodel on the cheapest budget possible, so the beige color is leftover paint from two rooms combined. The green wall is venetian plaster left over from one of the bathrooms we remodeled. My husband helped me resurface all the cupboards and we switched out the handles to match the rest of the house. I decided to keep my TJ Maxx hooks that I paid only a $1.50 for, but spray painted them antique brass to match the new fixtures on the cupboards. As for the ugly light fixtures, well they remain. I haven’t exactly decided what to do with them yet. I had some suggestions to spray paint them, which I really might end up doing that. However, it’s just so cold outside I will wait till the warmer weather to do that. The hooks were hard enough for me to spray paint! Now for the organization part. I didn’t want to go out and buy new baskets for the room so I just hunted around the house and rearranged some things in other closets to find the baskets I needed. They are mis-matched but they do the job. It really is amazing what you can find around the house that can help you just to become a little more organized. In my upstairs closet I had the two small drawers for our extra cold medicines and such. I just swapped out the large white one I had in the laundry room previously for these two small drawers and they really helped. Most of the stuff in the cupboards was just random junk that we had laying around. It’s really nice to have all the little glue bottles, batteries, and miscellaneous items all tucked away in these neatly organized drawers. Well that’s it! Another room finished. To many of you out there, this room may not look totally organized, but it works for us. I would love to have cute wicker baskets in all of the shelves, but I really didn’t want to go out and spend the money on buying them. Who knows, maybe some day I will be walking through a store and find some for a good bargain. Till then, it’s nice to have another room done in this house and only four more major rooms to go! This bathroom is on the main floor and another half bath. Who needs two main floor half baths???? Well, I guess the people who built this house did…it’s pretty stupid. I would have much rather had a large pantry in place of this bathroom. Just like all the other bathrooms, really ugly wallpaper. There is also a dated light fixture but unfortunately this is the only photo I have of the ‘before’ because my husband started tearing it apart before I could take any more. About four months after we bought the house I was cleaning the floor of this bathroom and notice the linoleum was sagging down behind the toilet. You know what that means: LEAK! 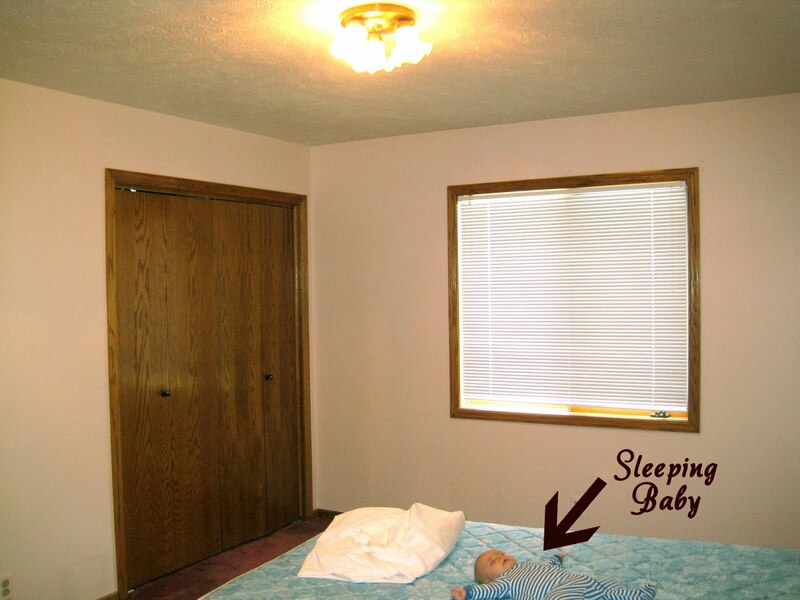 (Just another reason why you need a good home inspector when purchasing a home.) When we notice the leak, we decided to shut off that bathroom until we had time to fix it. Well the time has come and we have to deal with the leak. My husband started by removing the toilet. We found that the tank of the toilet had a leak and it must have been leaking for years. The floor was entirely destroyed under the toilet. He had to tear out the sub floor all the way down to the joists of the house. It was quite the process. Then he had to patch the hole where the floor had deteriorated. He did a pretty good patching job. Next we removed the chair rail and I attempted to remove the wallpaper. Like in all the other rooms, it was applied directly to the drywall which made it super hard to remove. I decided to paint over it. In short, we removed any lose wallpaper. Next, we applied joint compounded the seams of the wallpaper and anywhere the wallpaper that was lose was removed. Once the joint compound was dry, we sanded it down to make is flat with the wall. Next, I wanted to apply texture. 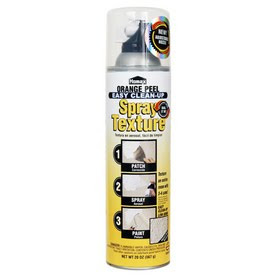 Instead of rolling on a texture or sanding the walls down flat we used this spray on texture you can buy at Lowe’s. I didn’t trust myself to aim it straight, I am kind of lacking in the hand-eye coordination. So my steady handed husband applied it to the wall and he said it was pretty easy. The only downside of this approach is the cost of it is pretty expensive. It took two cans for this tiny bathroom and it cost $11.89 per can! The texture takes about 6 hours to dry. After it was dry, I painted an oil based primer over the top of the wallpaper. Keeping with the spirit of remodeling on a budget, I decided to paint the bathroom with leftover paint from previous projects. This room has a chair rail, so I will use the darker blue from my hallway on the bottom half and the lighter blue from the kitchen on the top half. Once all the painting is finished, all we have left is to install a tile floor (hubby’s part), reinstall the trim and chair rail, change out the handles on the cupboard, and reinstall the toilet. We should be finished hopefully some time right after Christmas.